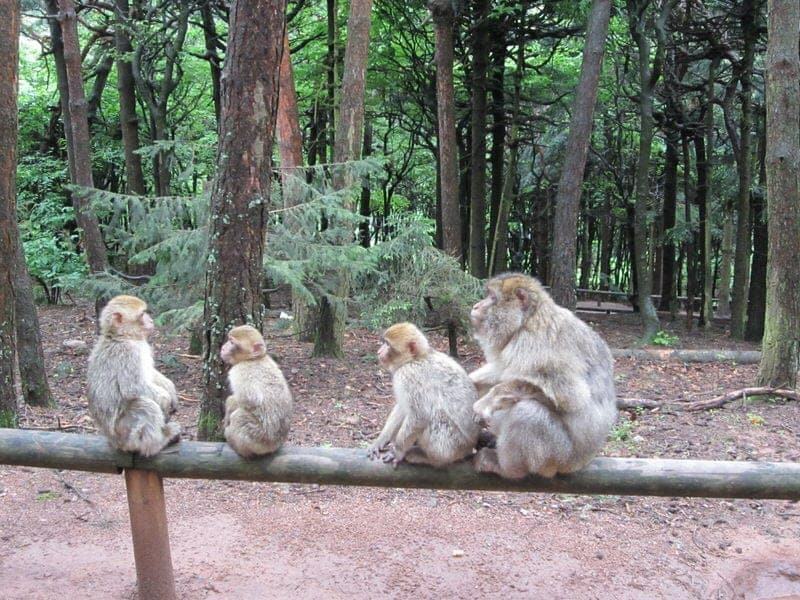 La Montagne des Singes, or “Monkey Mountain” in English, is a sanctuary for Barbary macaque monkeys in the Alsace region of France. There are over 200 monkeys in the 24 hectacre forested park that provides a place for both conservation and research of these monkeys. Barbary macaque monkeys are an endangered species native to the forested mountains of Morocco and Algeria (also same kind of monkeys roaming the Rock of Gibraltar), and have adapted well to the pines, firs, and oaks of the Vosges Mountains. 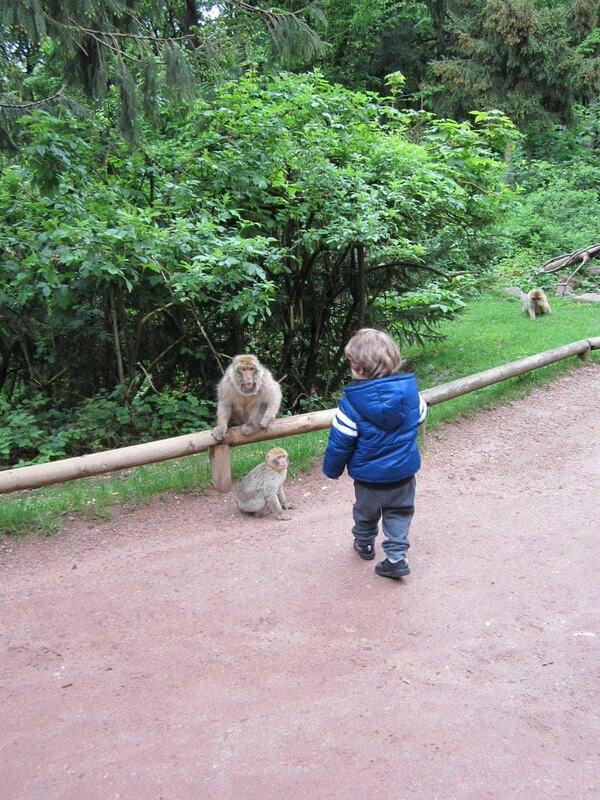 During our recent trip to the Alsace region of France, Ethan got very excited when he found out there was a park full of monkeys nearby so we had to make a stop at the Montagne des Singes. 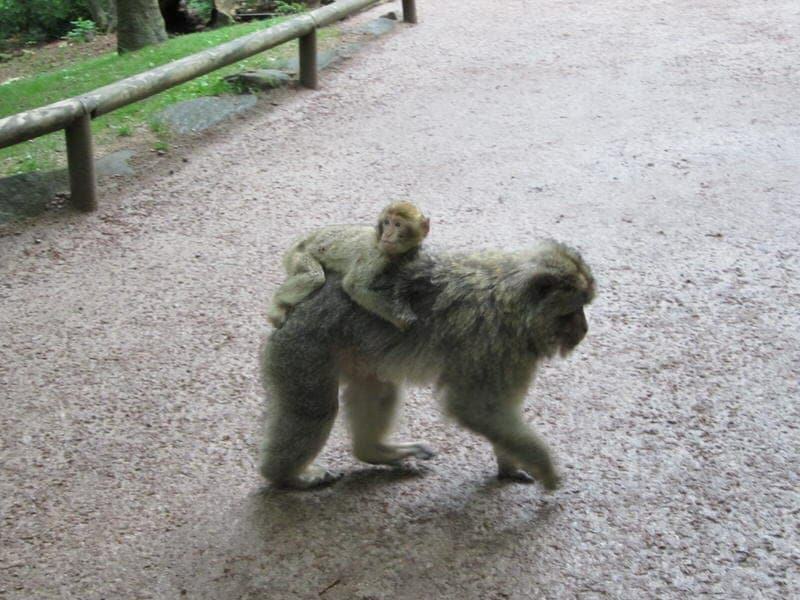 If you’re interested in visiting, we’ll give you all the details about the park, provide some tips on making the most of your visit, and tell you about our experience with the Barbary monkeys of the Alsace. La Montagne des Singes is located at La Wick, F-67600 Kintzheim, France. Montagne des Singes is not open year round, and generally opens in March and closes in November. See official website for dates and hours. You can drive (just make sure you head towards Kintzheim NOT nearby Kientzheim) and parking is free. If you don’t have a car, you can take a shuttle—the Haut-Koenigsbourg Shuttle— from the nearby town of Sélestat. Adults tickets are currently (as of January 2019) 8,50 euros, child tickets (age 5-15) are 5,50 euros, and children under 5 are free. The official website for the park is very informative. 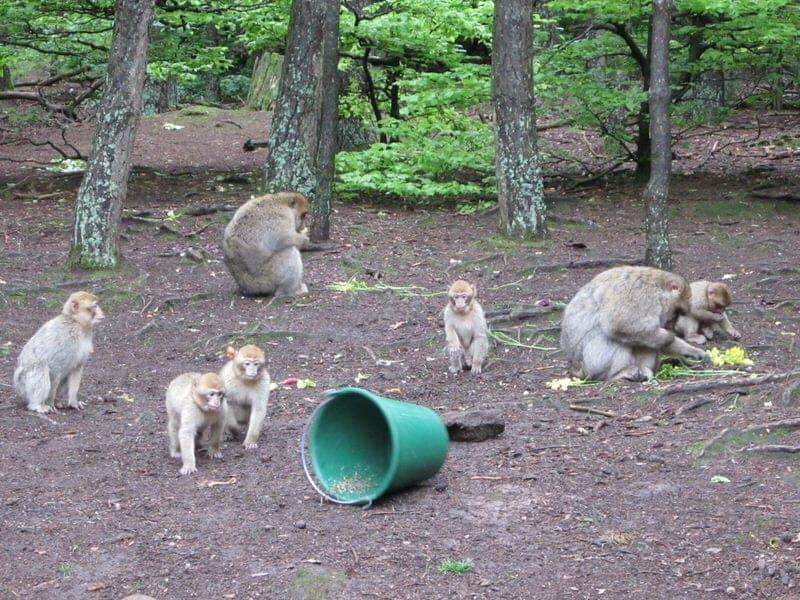 There are also three other locations of these Barbary macaque parks: Rocamadour, France, Salem, Germany, and Trentham, England. • Feel free to take advantage of the picnic table and you can bring or buy food for lunch. Note that you can’t take any food into the actual monkey area (other than the provided popcorn). • Bathrooms are located near the café and picnic area. • If there is a chance of rain, pack an umbrella or poncho as the path is completely outside and uncovered. • If you want to learn more about the monkeys, do ask the guides. Even if they don’t speak English well they will probably point you to the guide who does. We found them all to be quite friendly and knowledgeable. • While in the park with the monkeys, stay on the path, and keep children on the path for the safety of the monkeys and people! • Don’t close your hand in a fist near the monkeys or wave your arms at them, as the monkeys are likely to see this as a form of aggression. • There are many other things to do nearby including a visit to the popular castle Haut-Koenigsbourg. There are also an oddly large number of other animal-related attractions nearby such as Cigoland (a small stork-themed amusement park), La Volerie des Aigles (birds of prey air shows), and the Jardins des Papillons (butterfly garden). You can easily spend a day or two in the area visiting all these places and most (except Jardins des Papillons) are on the Haut-Koenigsbourg Shuttle line. If you take the shuttle, you’ll receive discounts to some attractions on the route. 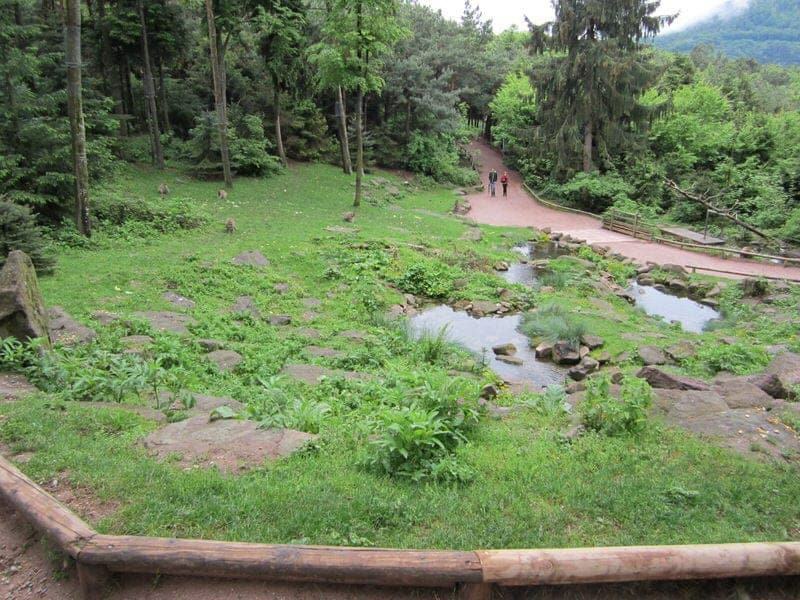 • Some people we met had walked/hiked from Haut-Koenigsbourg down to La Montange des Singes as it is not that far away so that may be an option if you want to get in some exercise as well. You can actually see the castle from the park as it sits further up in the mountains. Our GPS lead us around the curvy mountain road to the monkey park as it began to rain. We began doubting whether we should head back as rain does not mix well with visiting an outdoor wildlife park, but decided to keep going. We parked and walked over to the covered picnic area (past a group of wandering chickens) and ate our packed sandwiches for lunch. There is a fairly large picnic area and there is a little café that sells sandwiches, salads, chips, drinks, and ice cream. Our timing ended up being perfect as once we were done with our lunch, not only had the rained stopped, but several large groups of noisy, monkey-scaring French schoolchildren left. To enter the protected area to see the monkeys, you follow a path from the parking lot away from the picnic area to the entrance. We purchased our tickets and they gave us each a handful of popcorn, a pamphlet, and explained a few rules. Most importantly, you have to stay on the path and you are not to touch the monkeys. They also explain that to feed them the popcorn you should get near the monkey, put a piece of popcorn in the palm of outstretched hand, and then wait to see if the monkey grabs it. 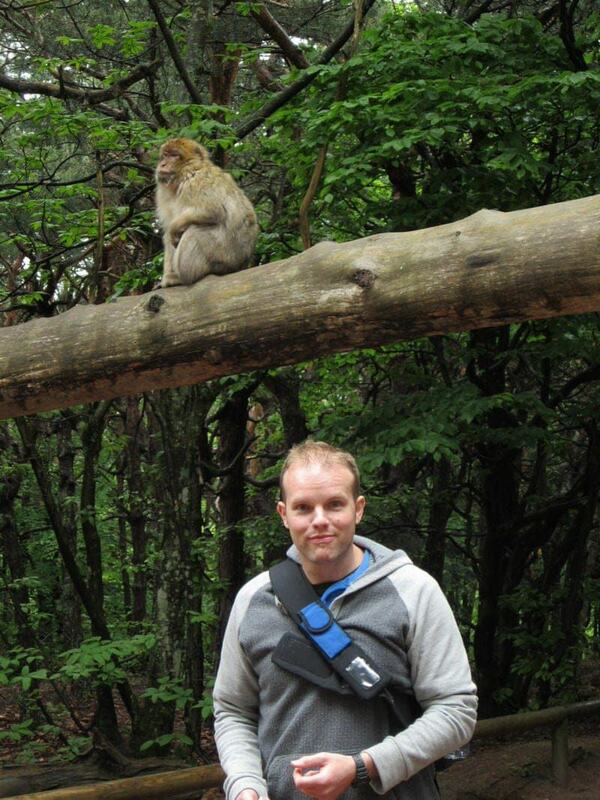 You walk along the self-guided path and you can see the monkeys as they roam freely throughout the park. We were afraid that the noisy schoolchildren and the rain may have chased all the monkeys into hiding, but luckily we sighted of our first monkey almost right away. 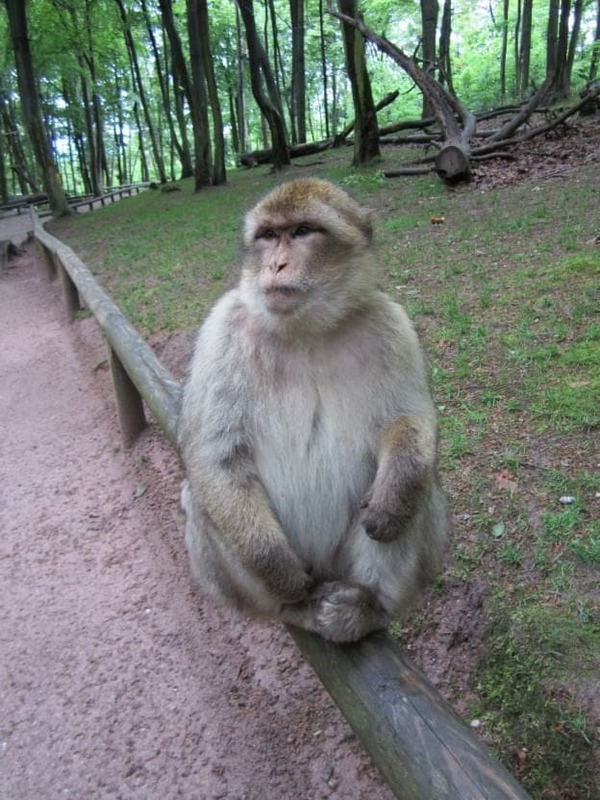 If the monkeys want popcorn they will usually sit on the low wooden beams or benches around the path. We were almost never able to coax monkeys from the trees or far away to come over for a piece of popcorn, so you can tell they are well fed. The monkeys, for their safety and yours, are trained not to walk into the path when guests are around so don’t encourage them or they’ll get scolded and chased away by the staff and guides. There are well over 200 monkeys in the park; however, since you are only seeing a small portion of the park (the rest is restricted access) you get to see one (of perhaps four?) of the “troops” of monkeys which lives in this part of the forest. So this particular troop when we visited consisted of about 60 monkeys. The monkeys are not naturally violent or aggressive—not even towards each other— and while I got frightened when one of the monkeys put his lips together and started blowing and moving towards me, he would have not hurt me. The guide explained to us that he was just trying to tell me to leave him alone. The Montagne des Singes guides are very knowledgeable about the monkeys and some have worked at the park for a very long time. The guides walk around the path and you can stop and ask them questions. Also about every hour they do an informational talk that sometimes includes a feeding and then you get a bunch of monkeys converging on one spot. We were the only English-speaking tourists so the talks were given only in German and French (the guide doing them at the time did not speak English) but one of the guides—a wonderful man named Franck—translated the information into English as best as he could while we listened and also answered a lot of our questions. We found the information on the social hierarchy and the “screaming matches” very fascinating. We got the sense that the guides really cared about the monkeys and knew a lot about them and the research being done at the park. In addition to the guides, there are also informational signs posted around the park that you can read and special quizzes for children. We spent almost 2 hours in the park and went around the self-guided path probably three times. I think most people do it just once and stay 45 minutes to an hour, but we really enjoyed feeding and watching the monkeys and talking to the guides. The rain had scared most people away so there were very few other people there during our visit, so we made the most of being relatively alone with the monkeys. We got really lucky as just before we left we spotted the 3-day old baby monkey (the first baby monkey of the year) and its mother! As you walk out, you’ll also see the little souvenir shop which has everything a monkey lover might desire, but we settled only on a postcard. Look carefully to see the 3-day old baby monkey! Overall, we had a wonderful experience here. 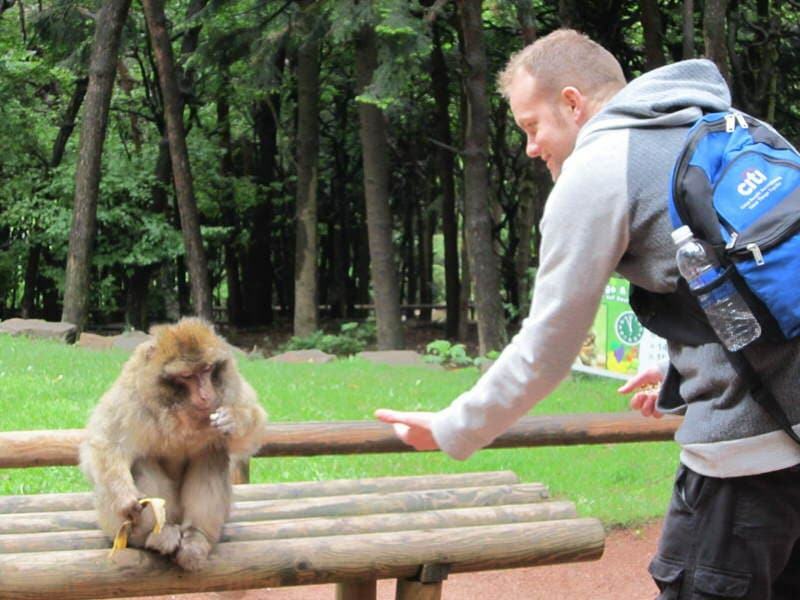 We really liked that there was a picnic area where we could eat our own food, we found the guides to be very helpful, and, of course, loved watching and feeding all the adorable Barbary macaque monkeys! However this place is not likely to be much fun if you’re not a fan of monkeys and it also would have been less fun in bad weather or with a bunch of noisy school groups. However, we found this to be a very enjoyable (and educational) place to spend a couple hours during our time in the Alsace region of France. Have questions about visiting La Montagne des Singes or have tips from your own visit to the monkey park? We’d love to hear from you! This sounds like so much fun! Do you know where the monkeys are from? Are they from the wild or rescued from zoos or circuses? 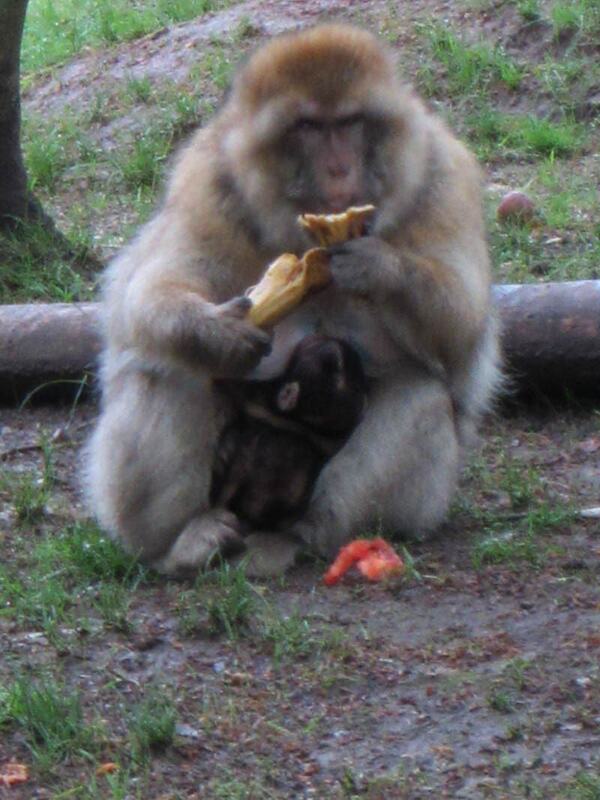 The Barbary macaques are native to northern Africa (Morocco and Algeria) and I believe a group from the wild was brought to the park for conservation reasons. They adapted so well and reproduced at such rates that they were able to reintroduce about 600 to the wild in Africa and open up three other similar sanctuaries. I just found your blog from Bonnie’s Travel Tuesday. La Montagne des Singes seems so much calmer and peaceful then on the top of Gibraltar. I had a monkey on my back grabbing my hair! Great shots of the monkeys and very informational. Welcome Amy and thanks for stopping by. Yes, several people have told me that they did not enjoy the Gibraltar monkeys very much, and I believe they are all the same species. But I think the monkeys are less tame in the La Montagne des Signes and visitors are not allowed to actually touch them as tourists often do in Gibraltar which might alter their natural behaviors more. Yes, we would love to visit one of the other three parks as well. It was a lot of fun. Wow, that looks like it would be so much fun! Don’t think I’ll ever go to France but who knows. Thanks so much for co-hosting the Bloglovin hop. You have a new follower. I just updated my site and would love for you to check it out. Hope you have a nice weekend. 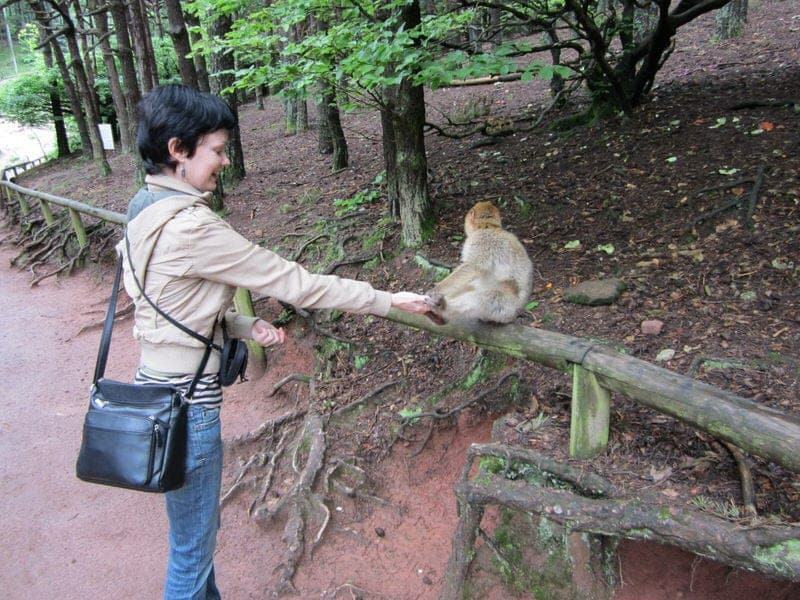 Yes, seeing and feeding the monkeys was so much fun! Thanks for stopping by and I will check out your site as well.